The Bosch GXS18 V-01N14 Starter Kit with (1) CORE18 V Battery (and Fast Charger) gets users started with unleashed power and productivity. The CORE18 V 6.3 Ah battery is the best-built battery on the planet (vs. leading power tool competitors), while the BC1880 18 V Fast Charger recharges the battery in less than an hour. 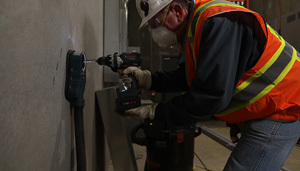 The Bosch CORE18 V employs next-gen Li-ion technology, producing 80% more power than previous-generation cells. CORE18 V's performance is comparable to competitor batteries that are up to 35% larger. CoolPack 2.0 technology provides up to 135% more battery life than batteries that don't have CoolPack. The included BC1880 18 V Fast Charger can charge a spent CORE18 V to 80% in 41 minutes and to 100% in 55 minutes. The charger has a dual-mode charge – the first 80% is very fast, while the remaining 20% is in regular mode.